Clay has a list. A lot of adventures are pursued from that list and many of those happen on the Island (I believe he has a specific section for that). So I was thrilled when talks started on a multi-day mountain bike camping tour in July 2014. Many of our friends had their name in the hat at the start of these talks but for one reason or another, Clay and I were the only ones left when the time came. A plan was outlined if somewhat vague. 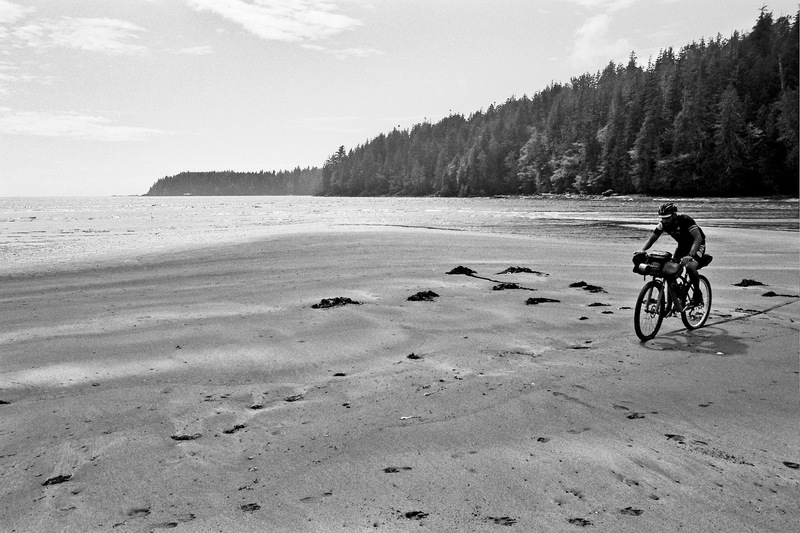 The idea was to ride from Victoria to Bamfield and back. 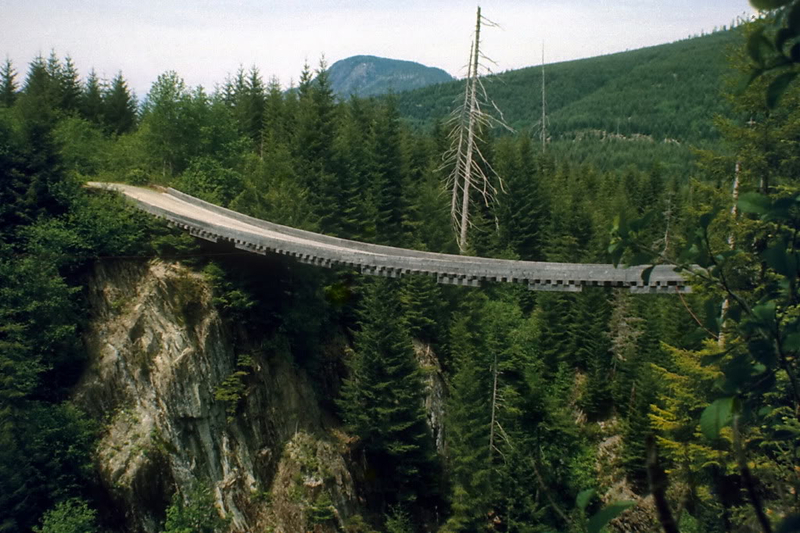 This would be done mostly on logging roads. The condition of those roads was not known but in some cases estimated questionable. The distances were somewhat unclear as well but seemed to be around the 500km mark. The climbing was also significant. 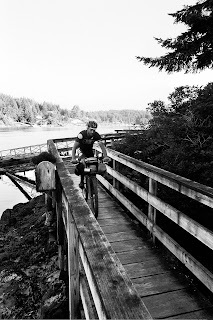 Therefore we soon started referring to the ride alternately as the Bamfield500 or Bamfield Rising. To this day we have no idea of the actual km’s covered or meters climbed. It was an old fashioned tour. No computers, no GPS, no clue. 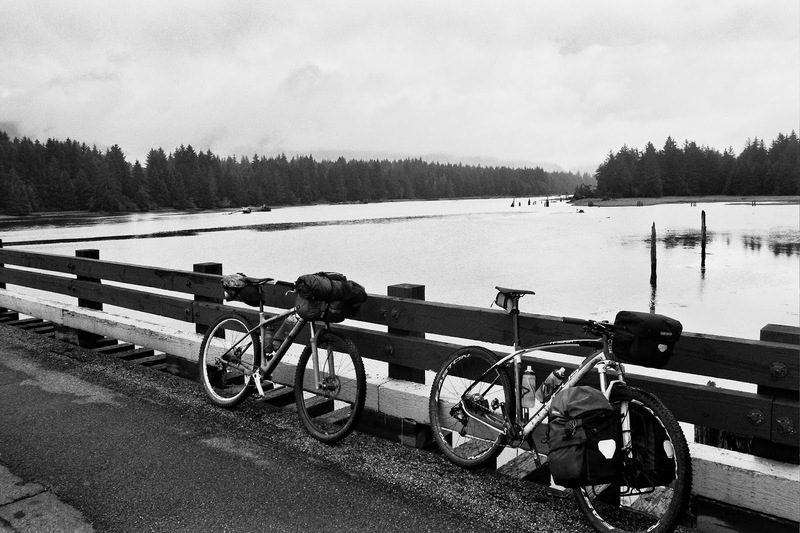 We set out on a rainy morning in Victoria and headed for Port Renfrew. The going was good for the first little while, spirits high and easy navigation. After taking the Mill Bay ferry and enjoying a fine Caesar at the Black Swan pub we set off on to the logging roads. From Shawnigan Lake we took Renfrew Road to Kapoor Main towards Port Renfrew, and when we came to a fork in the road we took Old Port Renfrew road. From studying the map we knew that there was a “bridge out, impassable” section on that road but thought little of it as we imagined we could carry the bikes, ford rivers, etc. However, the “impassable bridge” proved to be just that. There had been a suspension bridge there in the old days, but that had been removed years ago and the canyon it had traversed was daunting to cross. We started looking for a way around the canyon. But the impassable nature of the forest on the island came as a bit of a surprise to us. You simply couldn’t bushwhack through the forest to get around obstacles. We looked for a way around for a while but to no avail. The forest is just too dense. This may have to do with the logging practices exercised around here, or maybe that’s just how the forest is but whatever the cause, it was clear we would not break through easily. We crossed the valley and tried to access the road from the other side. 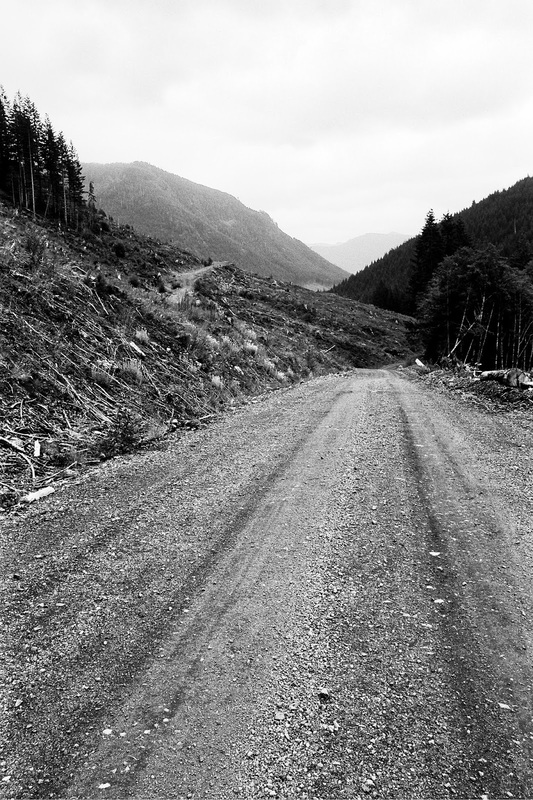 The endless spurs of logging roads were difficult to navigate and our maps were sub-par for those exploits. So we eventually caved and took the long route around. We estimated our re-route was about 40km or so and included a huge but beautiful climb. This added about 3hours to our day. 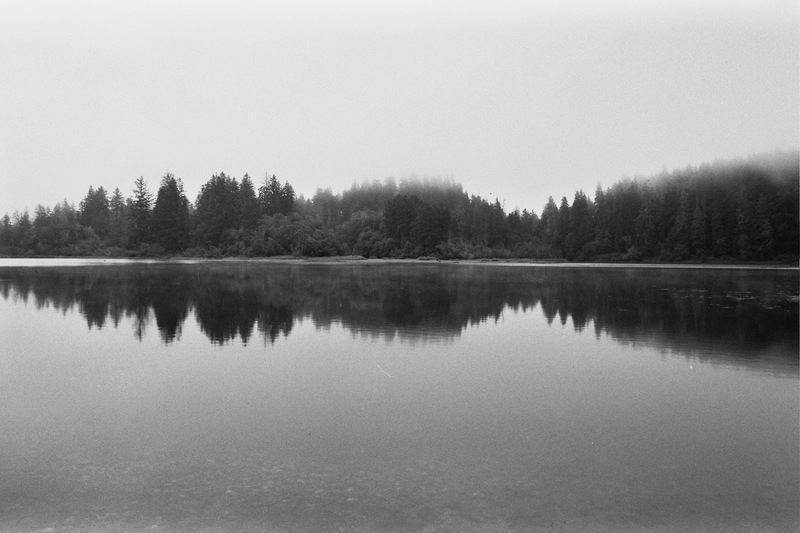 I was starting to look around for a camping spot at this point but Clay kept driving us further, with a determination in his eye that I have learned to respect and fear at the same time. Old man Fireroad can sometimes be like a horse that knows he’s getting close to the stable. A determined guy that one, but that's what you need sometimes on trips like these. We gambled on a couple of more roads that were closed but in those cases we made it through closed gates, across decrepit bridges or through streams were bridges had been removed or washed out. 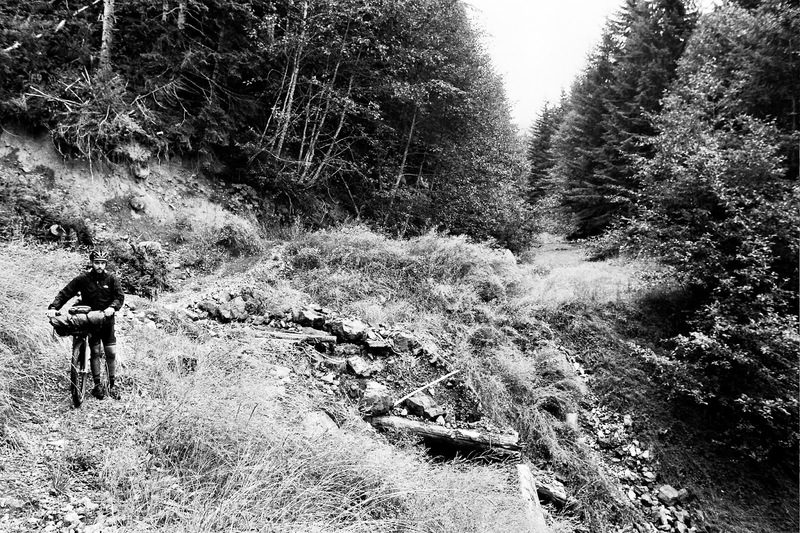 East Lens main was particularly desolate but the tell tale tread pattern of trials motorcycles kept hopes high. Hell, if you can ride a motorcycle through you can certainly mountain bike. Exhausted but happy, we arrived at Fairy Lake just after nightfall. 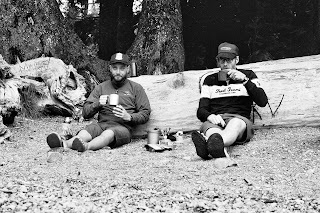 Second day started with a brief visit to Port Renfrew for breakfast and then we headed up Gordon main. We stopped to check out Avatar Grove, which has some very impressive stands of trees and that cathedral feeling you get when you stand among the giants. The Gordon main was quite different to the smaller roads we had been on the day before. On our first day we did not see a soul for the whole day but on the Gordon the occasional car and logging truck passed us and the big road seemed to stretch on forever. 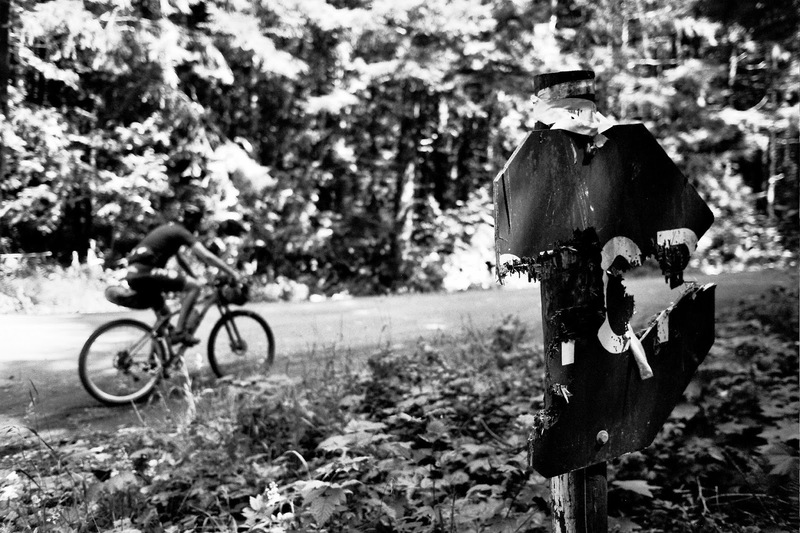 The Gordon epitomizes the gravel grinder cliché. 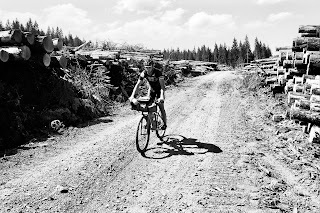 To keep us entertained we kept thinking up gravel races and what would be the best setup for such a race. When words dried up, we just looked around and enjoyed the view. After a while on the Gordon we took the TR2 towards McClure Main. This was another one of our Hail Marys. We knew the road was closed but if we could make it through we would save 80-90km’s. The urgency grew as we started up the road because it went straight up. We climbed for just under an hour solid and were committed at that point regardless of the numerous “road closed” signs we saw. The road started tilting down, we were over the climb and heading down the other side. The road kept getting smaller and smaller. We worried about the steepness of the terrain; we heard the river far below to the south and on to the north a steep mountainside. The likelihood of another canyon was high. After descending for a bit we came upon a broken down blasting drill that seemed to be placed in the center of the road on purpose. Soon after we found the reason for the road closure. A landslide had taken out the road. We were able to cross without much difficulty however and ripped the descent down to McClure main. That felt like a great victory. We celebrated with whiskey. The McClure took us to Walbran main and the scenery became even more spectacular. 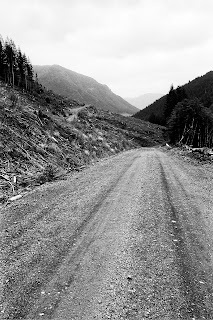 Deep valleys with tall trees and huge clearcuts. We were obviously gaining elevation too because the flora changed slowly and became more alpine. We could also feel it in our legs. Neither one of us had bothered to weigh our rigs but loaded climbing is an entirely different animal to the unloaded kind. When we got to the Carmanah, Nitinat intersection. it was clear we would not make it to Carmanah before nightfall. We had to make a decision to not go there and head to Nitinat instead. We had simply run out of daylight and out of legs. As a consolation, we climbed down to Looper canyon and took a peak around and cooled of our tired bodies in the river. Then we rolled down to Nitinat village and camped there for the night in a very nice campground right next to the lake. 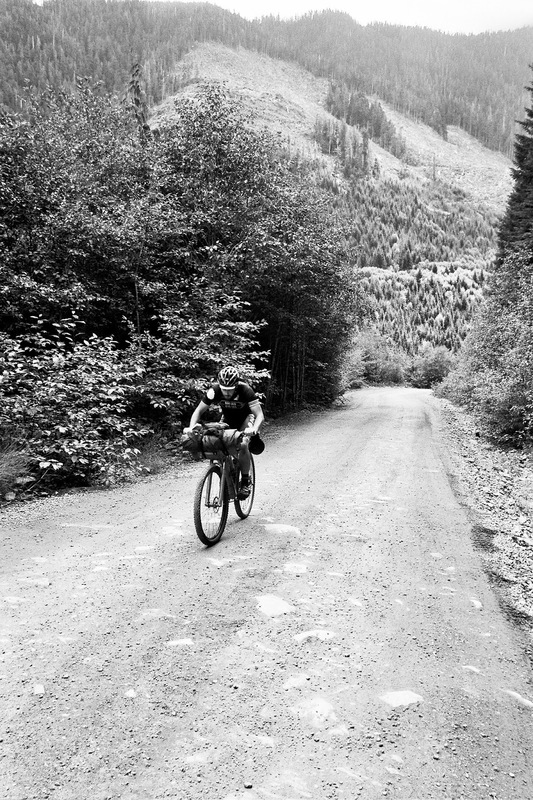 Day three was fairly uneventful as far as the riding went, a pretty harsh gravel grinder of a day really. It was odd to be on a highway again but yet so clearly in the middle of nowhere. Then all of a sudden we were on pavement. I guess it made sense to pave part of the highway to expedite logging transport, but what a bizarre stretch of pavement. An aero tuck with front racks and panniers may sound silly but we made great time on that section. We got to Bamfield early, which was great, because that meant we could look around for the afternoon. After debating weather to go straight to the bar or not, we decided to take a look down at the docks. Bamfield is separated in two by the Bamfield inlet and you need to take a sea taxi to get across to west Bamfield. 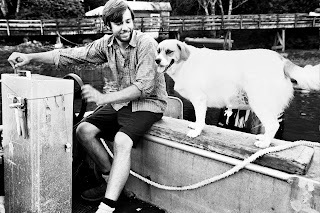 We found Jake and his Mother dropping of supplies on the dock. They saw us fumbling around and asked if we wanted to get across. Grateful for the ride we helped them load the boat, loaded our bikes and jumped in. Jake said he’d take us back across in about an hour and a half if we’d like. 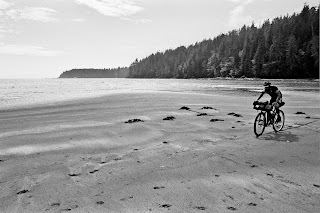 So we got on our bikes, checked out the stunning Brady beach and then had a beer with the locals at the convenience store/liquor agency before heading back over the inlet with Jake. Jake’s mom served us White Russians on her porch while we waited for Jake. 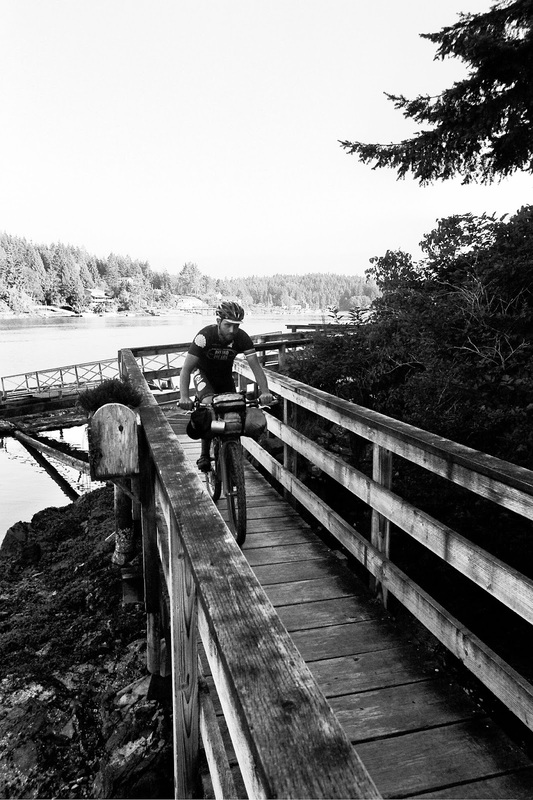 After a burger at the Hawk’s nest pub on the east side, we headed to Pachena Bay campground for the night. This is among the prettiest campgrounds around. We came there late and thought we’d just grab a spot and pay in the morning. Then the people that had reserved that spot showed up, so we spent the night camped on the beach. 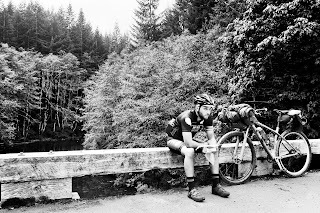 We were dreading the climbs the following day since the previous day had some sharp descents. A Bamfield local had told us to take the Flora Main instead of the way we had come in and this cut a bit of distance out and had more manageable climbs. Not to mention a more serene road. There had been some heavy logging on the Flora mainline but we were there on the weekend and had no issues getting through. 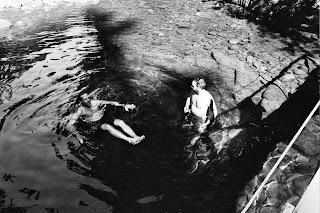 Then we had a big grind of a day until we got to Kissinger lake where we went for a refreshing swim. We bumped into a friend of mine who gave us a nice cold beer, which felt amazing at that point. 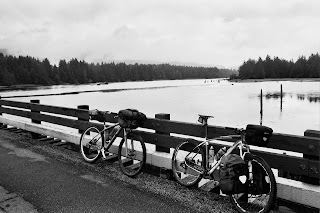 Then we saddled up again and rode the length of Cowichan Lake to Youbou, the town of Lake Cowichan and eventually to Stoltz Pool campground where we spent the night. 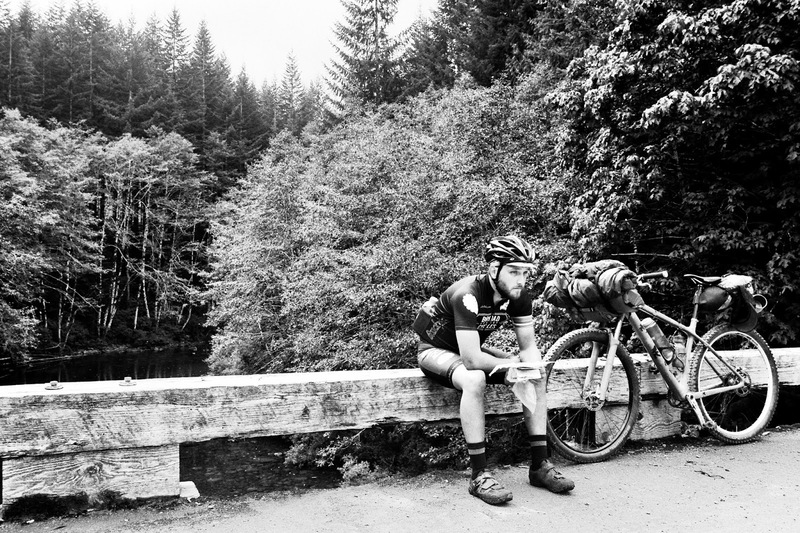 This was a long day in the saddle on big open roads and we certainly earned our dinner that day. On the last day we woke up and were still feeling the lust for adventure. We had seen a possible connector on our maps from Skutz falls to Crescent main and so we tried to link it up. After three hours of hike-a-bike all of which was uphill we decided to pull the pin and turn around. A slight variation of the routing back dumped us out on Crescent main after all and we cruised to Koksilah, another beautiful day on the logging roads. Clay has a friend that has a stunning property right on the Koksilah, so we paid him a visit and swam in the river. 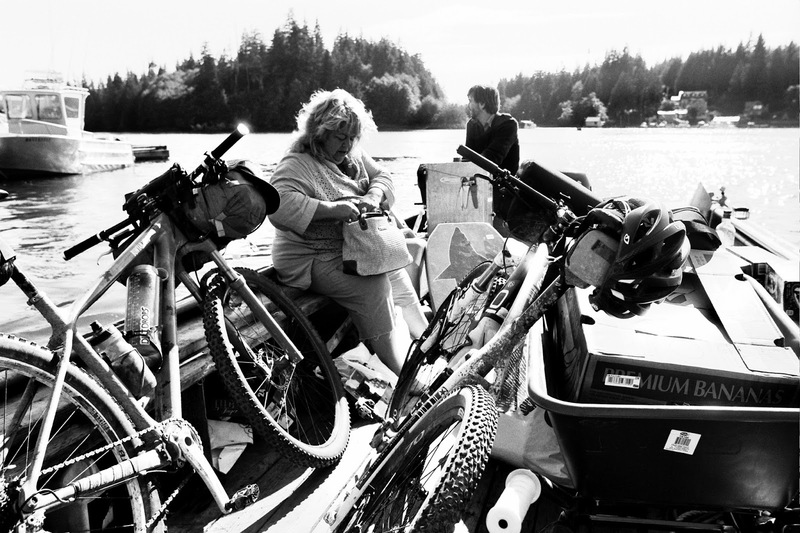 Then we drilled it back to the Mill Bay ferry and enjoyed a tall can on the dock. These were a great few days on the bike and set the tone since then for Clay and I. 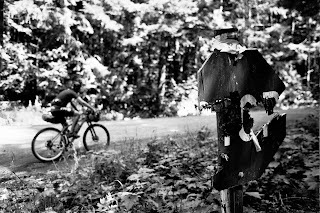 The riding on Vancouver Island’s logging roads is amazing and it has opened up a whole new segment of riding for the Stuckylife crew. 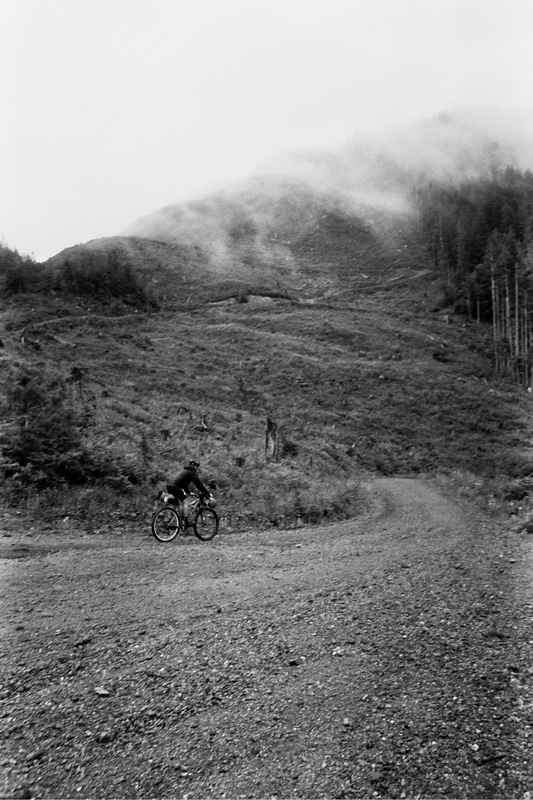 We still love track bikes, Cyclocross, Mountain biking, and Road riding but we also love the gravel and the Backcountry. Also check out @stuckylife on insta and search for the #bamfieldrising #bamfield500 tags.